I have been very active in the Charleston Convivium of Slow Food, I’m a board member and have been serving as the volunteer coordinator and membership chair for a number of years. The Chapter leader asked me the other day if I would submit an Italian recipe using local ingredients for the Autumn newsletter. I am still blushing I was so flattered, despite the fact that my last name was spelled wrong. Pumpkins are everywhere and even though a number of the local pumpkin patches have been shipping pumpkins in from other states to supply the demand for Jack-o-lanterns, the little guys that are perfect for cooking are, for the most part, local, mine was at least. Since this was a recipe for Slow Food, the majority, if not all of the ingredients, had to be local. 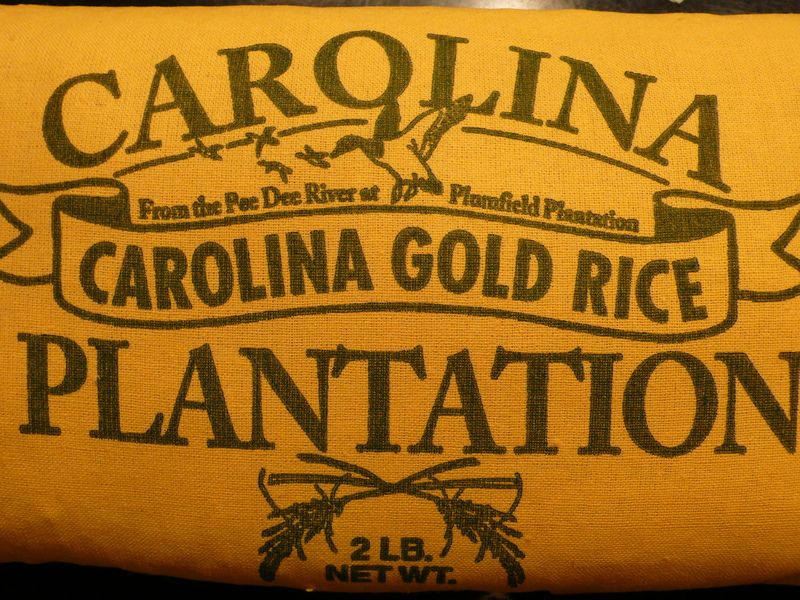 I have been making a lot of risotto lately, and normally wouldn’t make it with a long grain rice, but for the sake of Slow Food, I used Carolina Gold Rice, which is a heritage crop which was brought back to production in the past 15 years and locally grown just south of Charleston. 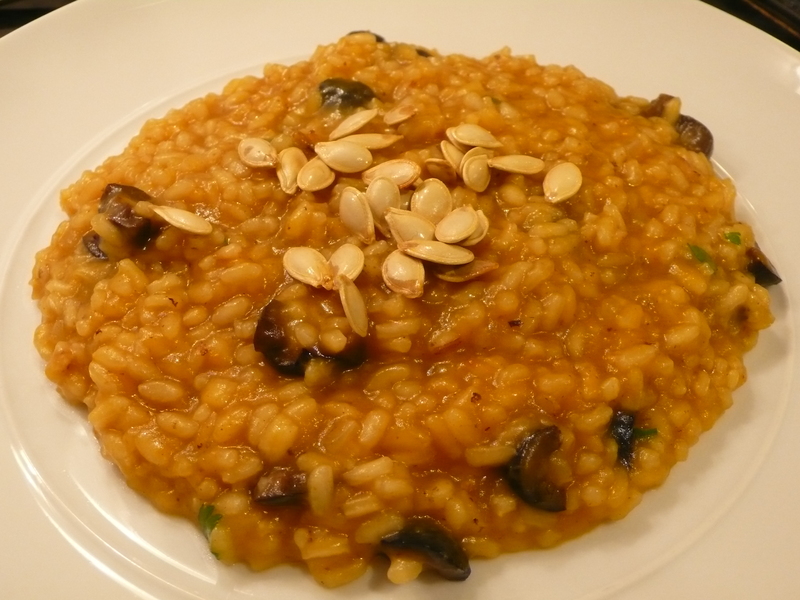 It has a wonderful nutty flavor and worked surprisingly well for a risotto, not to mention it’s rich history for this state. I can’t take the credit for creating an entirely local meal, I suppose I could have used muscadine wine in lieu of pinot grigio and found another locally made tart pickle in lieu of olives. 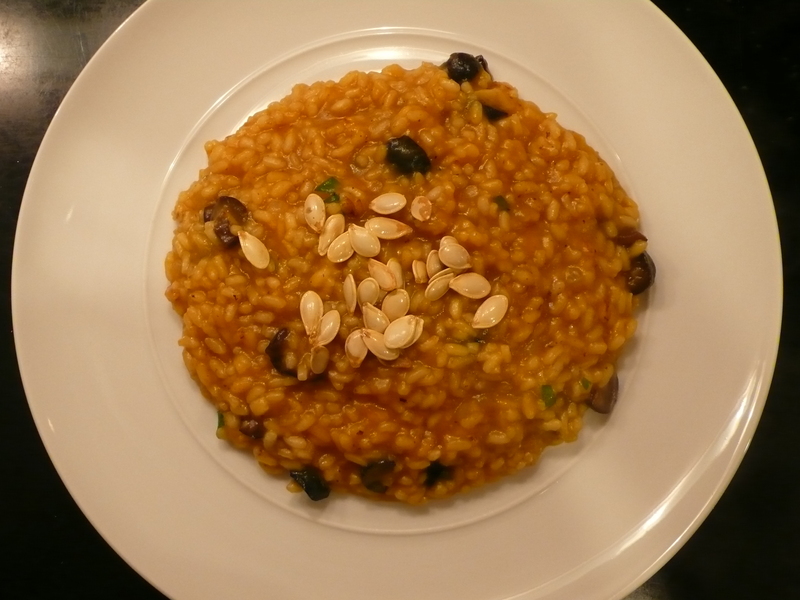 I have found that risottos that are strictly pumpkin are too sweet and need something to cut the sweetness. Olives, as I discovered the first time I made this dish, are the perfect pucker for the pumpkin. Preheat the oven to 350ºF. 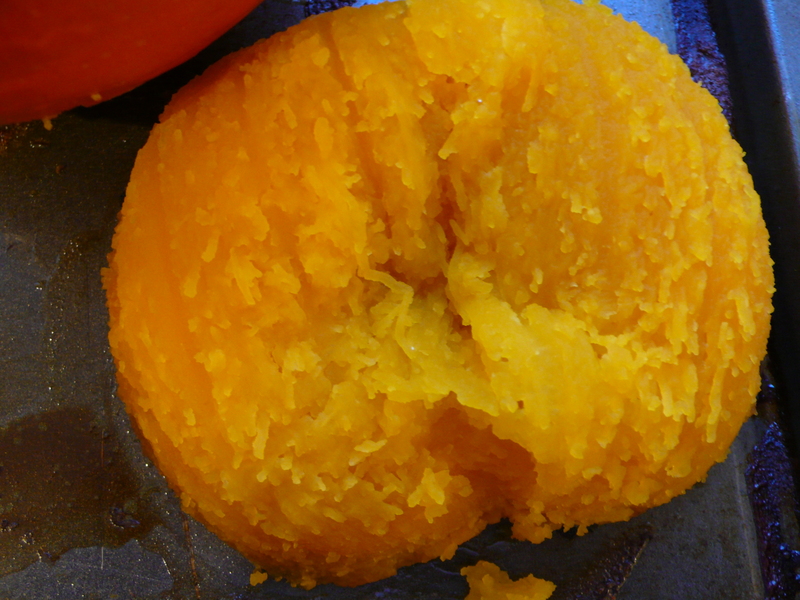 Slice the pumpkin into 4 slivers, scrape out the seeds and set aside in a bowl of cold water, paint the pumpkin with 1 tbsp of olive oil and place on a baking sheet in the center of the oven for 30 to 40 minutes, until tender. 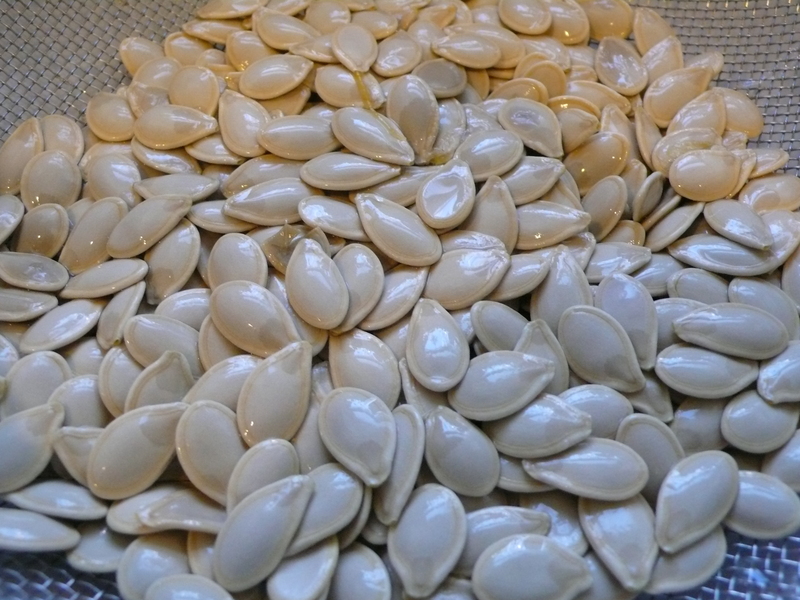 After the pumpkin seeds have soaked for a few minutes, clean the membranes off with your fingers and rinse in a fine mesh colander. Dry with a kitchen cloth, toss with the remaining olive oil and place in the oven with the pumpkin for 15 minutes or until golden brown. 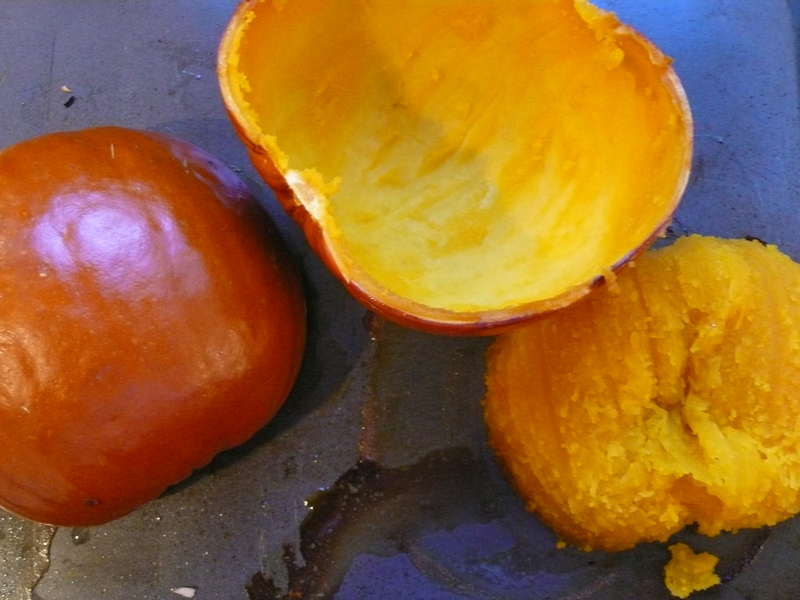 Remove the pumpkin and the seeds from the oven, let the pumpkin cool before removing the skins, this can be done in advance. 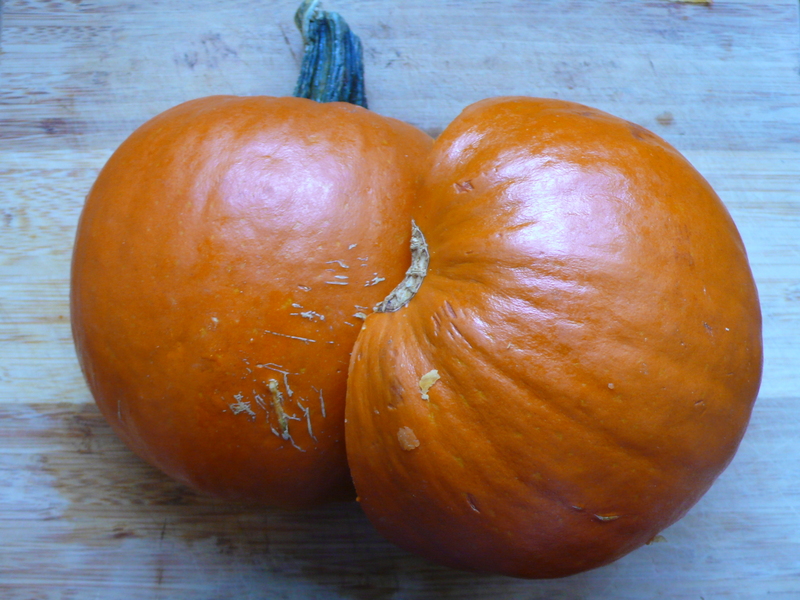 When the pumpkin has cooled and you are ready to make the risotto, mince the onion and bring the broth to a simmer. Heat a large stovetop casserole pan over medium-high heat and melt 2 tbsp of the butter at the bottom of the pan, covering the pan. When the butter is melted add the onion and sauté it until the onion is translucent. Add the rice and coat it in the butter, toasting it a bit. 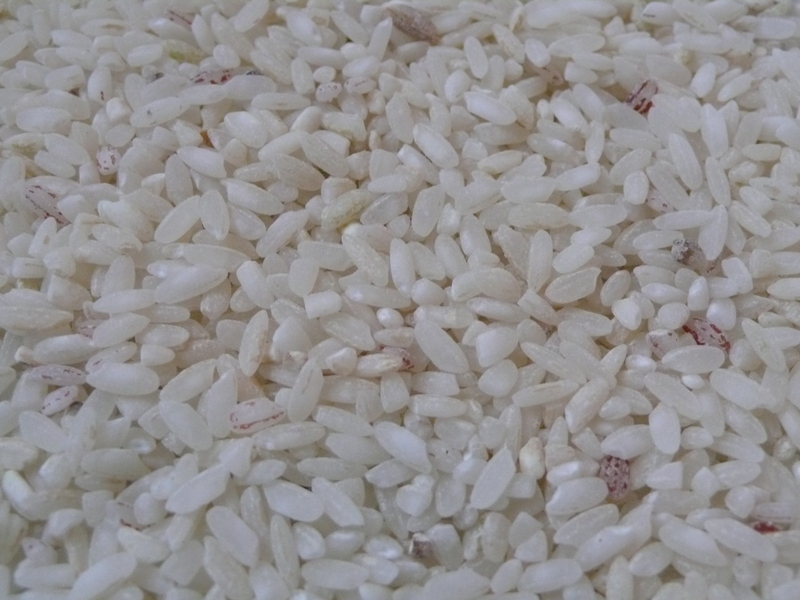 When the rice becomes opaque, after about 1 minute, add the wine to the pan, enough to cover the rice, stir frequently. 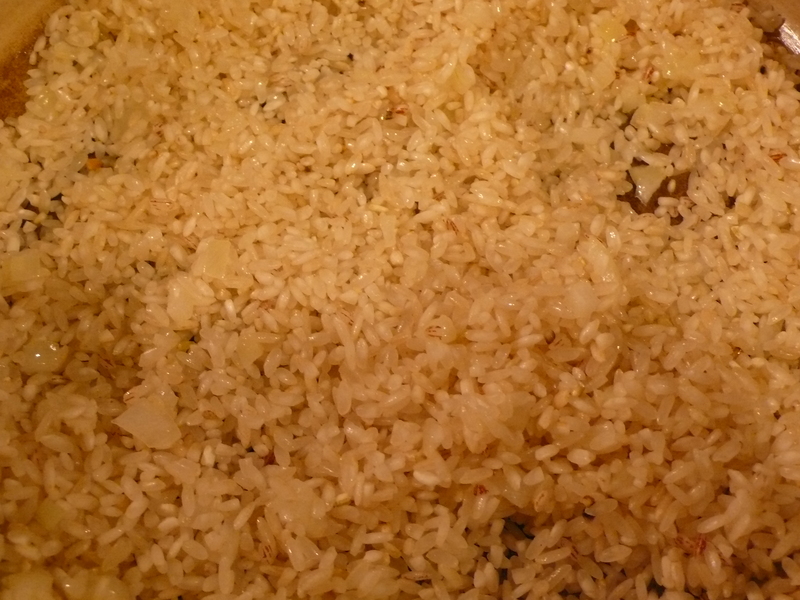 When the rice has absorbed the wine, add a ladleful of broth to the pan and continue stirring. 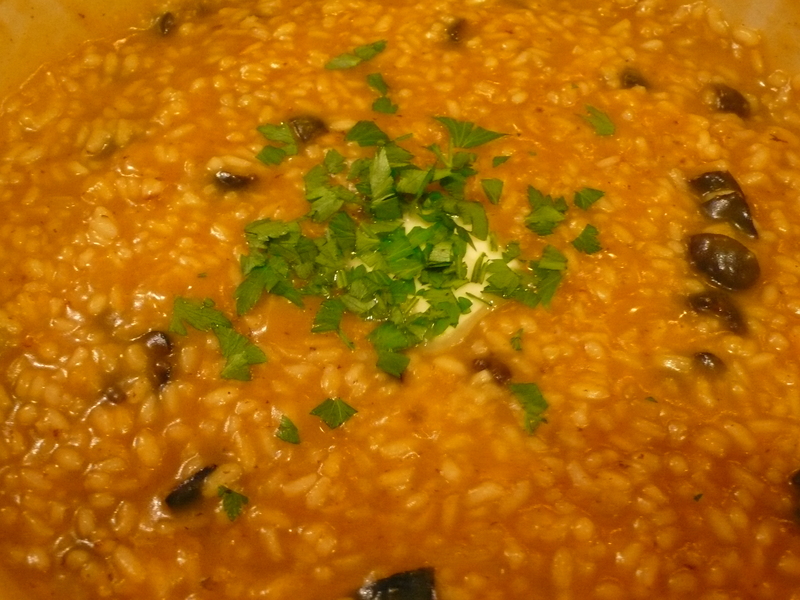 Repeat and once the rice starts to absorb the broth add the roasted pumpkin, the pumpkin should be very tender and should melt into the risotto without having to cut it. Add one more ladle of broth and add the chopped olives. Continue adding the broth as the rice absorbs it, you want it to almost dry out and create a path with the spoon on the bottom of the pan before adding the broth each time. When the rice is finished it should be al dente and all of the liquid should be absorbed. Remove from the heat, add a tab of butter and stir in the chopped parsley. 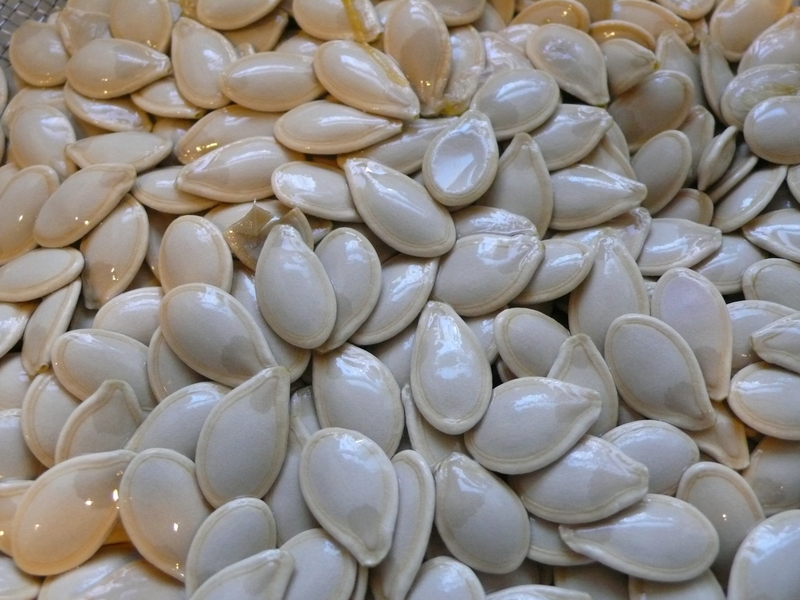 Serve immediately with roasted pumpkin seeds for garnish. ~ by italicious on November 9, 2011. I got this message in an email this morning! Good morning Virginia, and congratulations! Matt Lee and Ted Lee have chosen your submitted recipe as a winner in the Lee Brother Your Holiday recipe contest. You are among the distinguished group of 25 winners that will be featured statewide in participating grocery stores and on Facebook.com/leebrotheryourholiday and your recipe will be shared online at CertifiedSCGrown.com. Just watch for the posters in your grocery stores featuring the top 25 and online at the SC Department of Agriculture’s website and Facebook in the coming weeks. Again, congratulations from the SC Department of Agriculture and the Lee Brothers!